Littleton Joseph Henderson III obituary. Carnes Funeral Home. Littleton J Henderson III (Brother or Junior to friends and family), born on July 13, 1930, was the oldest boy of 9 children born to Littleton (Lit) J Henderson II and Marie Eula Chargois (both deceased). Brother had to work while attending high school in order to help support the family, due to the unfortunate passing of his father. He worked as a carpenter, a handyman, and as a horticulturist in a flower shop, before going being drafted into the U. S. Army. When he returned from the Korean War, he was able to find a job cutting grass at Galveston County Memorial Hospital. His ability to learn and his work habits continued to get him promoted and moved up in the hospital until he became Chief Engineer of the hospital, where he stayed until he retired. While working at the hospital, he met and married Lois A. (Toni) Chambers (deceased). Three children were born to their union and after living in Galveston for 10 years, they moved to their home in Texas City. Junior was an active member and supporter of the Queen of Peace Catholic Church, as well as a 50+ year member of the Knights of Columbus. 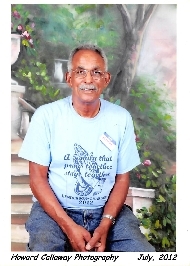 He was known throughout the La Marque and Texas City community for helping many by repairing air conditioners, ice machines, refrigerators, and whatever else people needed repaired until he was physically unable to do so. He leaves to cherish his memories of love and devotion: three children, Littleton J. (Scotty) Henderson IV (Patree), Winifred A. (Wendy) Jones (Simone), and Rev. William A. (Billy) Henderson (Nicky); six grandchildren, Mariah C. Henderson, Danielle A. Jones, Isaiah E. Jones, Kristen A. Jones, William A. Henderson II, Maranda N. Henderson; and a very large host of nieces, nephews, friends, and church family who will miss him greatly. There will be a public visitation held on January 31, 2018 at 5pm with a rosary to begin at 7pm this will be held at Carnes Funeral Home, 3100 Gulf Freeway, Texas City Texas. A second visitation will be held on Friday February 1, 2019 at 9am with a church service to begin at 10am. Services will be held at Queen of Peace Catholic Church located at 1224 Cedar Drive, La Marque, Texas 77568. Burial to follow at Mt. Calvery Cemetery in Galveston, Texas.